We started out the first quarter of 2018 with a bang! And, here we are already two weeks into April. Personally, I like this time of year because it has started getting lighter outside, and we are finally getting the awful winter months behind us (for the most part). 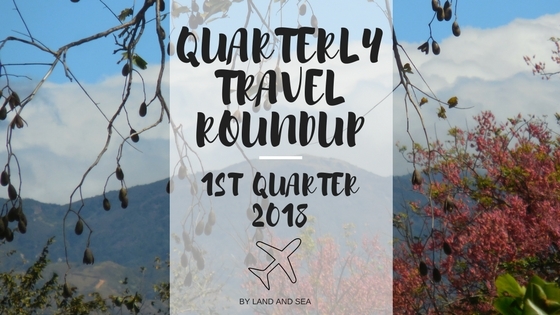 Yet, here I am already writing another quarterly travel roundup post! These quarterly posts highlight our travel activities by offering glimpses of things that haven’t made it onto the blog yet! We were invited to spend some time in Las Vegas celebrating a friend’s birthday this month. However, some changes to my hubby’s vacation policy at work meant that he wasn’t able to take off the time needed. While we were really bummed by this, we’re hoping to visit our dear friends some time later in 2018. We spent the rest of January planning and preparing for the trips that were on the horizon. Nearly one year ago, we booked a tour of Costa Rica! We’ve wanted to head to this beautiful country for some time and found a great deal with a tour company we’ve been curious about. While we don’t typically travel with tour groups we decided to go this route for this particular trip. It was a great deal, we wanted to try out this particular company, and we liked the fact that we could tour Costa Rica with minimal planning or effort on our part. As we both work full time and are each finishing out our degrees, sometimes this really is an appealing option for us. Anyway, the trip itself was great and we easily fell in love with this amazing country! In the not so distant past, we thought March would be my last month working for my current employer. With the mindset that I might be transitioning to a new employer with less vacation time and flexibility, we knew we wanted to go on a “last ditch trip” this month, and began looking at some options during summer 2017. Fortunately, I was able to secure a full-time, permanent position with my current employer. Our March trip became something more of a celebratory trip as opposed to a farewell trip! We found a great airfare rate during a cyber Monday sale, and bam, we were in full on planning mode! Now, because we did nothing more than fly on the last day of March, we’re keeping our destination a surprise on the blog for now! During the first quarter of the year, I started back up with classes and am approaching the finish line for my Master of Sustainable Tourism degree. My first class of 2018 looked in-depth at the way food impacts tourism, and tourism impacts food. I also started my last class – Sustainable Tourism Business Management – prior to my final thesis project! I simply cannot believe that I’m at this point in my education! And, for those of you who are asking “how does she do it?”, here’s a sneaky little fact… I created and scheduled this year’s first 6 months of blog content on By Land and Sea before the end of 2017 when I was on a break from school! Productivity and proactive planning allow me to work ahead in slow times so that I’m better able to keep on top of everything on my incredibly full plate! Cannot believe one quarter of 2018 is already in the past! Nice to read about your fun/fabulous trips. Yes, it is hard to believe. This year is already flying by! So glad you’ve been enjoying the posts! Pretty good going for the first three months of the year! Some great looking trips. I look forward to reading about Costa Rica. We also line up blogs for future publishing. We wouldn’t have time to do it otherwise!